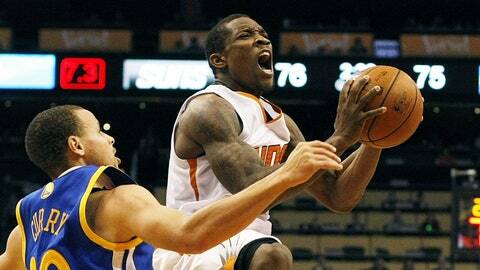 Eric Bledsoe had 24 points and fellow point guard Goran Dragic had 21 for the Suns in their 106-102 victory over the Warriors on Sunday. PHOENIX — The alleged tanking project is in terrible shape. But the long-range quest for a playoff ticket in the NBA’s nasty Western Conference is going surprisingly well. For perspective of how well, let’s check in with Goran Dragic. “Nobody really expected us to be in this spot right now, but it’s nice,” Dragic, the left-handed half of the Suns’ “Dragon Blade” point guard tag team, said after Sunday’s 106-102 triumph over the Warriors at US Airways Center. The exact spot is sixth place in the conference standings, just one game shy of fifth. Based on overall record, they’re actually one game behind the fourth-seeded Clippers, who would have a big tiebreaker edge for success within the conference should the Suns pull even with them. Sure, it’s early, but it’s also pretty sweet considering how league and franchise observers had full-season win-total predictions that were close to where the team already resides. The Suns have achieved a five-game winning streak for the first time since Jan. 21, 2011 and own a record of 14-9. Specifically, everyone was extremely interested in finding out how Dragic and newcomer Eric Bledsoe — the “Blade” half of Dragon Blade — would blend. And injuries to both parties prevented a reasonable sample size from being corralled for analysis. But since Bledsoe returned from a shin contusion, he and Dragic have steered the Suns to a 6-2 mark. Each half of Dragon Blade entered Sunday’s game averaging 19 points and six assists, putting this partnership near the top of the NBA backcourt statistical heap. Their counterparts for this positional showdown — Golden State deadeyes Steph Curry and Klay Thompson — were averaging even more points, making for a truly compelling battle. When it was over, Curry (30 points) and Thompson (19) had the scoring edge, but the Suns’ duo was a bit more efficient. “It means a lot to us as individuals,” Bledsoe, who had 24 points, eight rebounds and eight assists, said of battling Curry and Thompson. “I think we’ve done a pretty good job of locking in all season, not just this game. Suns coach Jeff Hornacek, presiding over a team that — through temporary fits of troubling offense — requires loads of teaching, was impressed by the work of his backcourt. Appreciation for Dragic and Bledsoe included a significant dose from the Golden State bench, which is presided over by Warriors coach Mark Jackson. According to hoopsstats.com, both Suns are ranked among the NBA’s top seven point guards in terms of overall efficiency. Bledsoe is fourth — behind former Clippers teammate Chris Paul, Curry and the Wizards’ John Wall — while Dragic is listed seventh. Although finding enough work for two dominant ballhandlers requires a bit of tinkering, Hornacek and his assistant coaches are coming up with ways to use their skills to keep defenses off-balance. The Corner Series was attempted, with little success, by the Suns at the beginning of Alvin Gentry’s final season running the show. With two dangerous ballhandlers on either side of the floor now, this Suns team looks a lot smoother in its timing, movement and reads. This alignment keeps help-side defenders busy on one half of the floor — via basket cuts on overplays or pick-and-roll action — while the other guard is receiving an off-ball screen on the weak side. With the ability of Dragic and Bledsoe to drive and dish or drive and pull up, defenses have been on their heels. Combining all of the Suns’ offensive actions with those talents, the Suns now rank sixth in the league in offensive efficiency. Add Dragic’s recent 3-point shooting rally — 10 of 15 combined over the last three games — and it’s obvious Phoenix is cookin’.